New Users – ePlan Solution, Inc.
For New Users the Quick Start Guide will guide you thru the creation and submittal of your project. See additional post concerning each individual jurisdiction and their requirements. In order to begin, you must register an account with ePs thru the Jurisdiction / ePs website. Go HERE and select “Get Started” for the appropriate location and then “Register new Account”. Complete the information and submit. You will receive TWO confirmation emails, one from Amazon Webs Services (this allows us to send you email), and two a User Confirmation Email from ePs that activates your account. The application contains some required information indicated by * and bold text, other information should be completed as necessary. The applicant should make every attempt to provide the City with complete and accurate information. Failure to do so may delay the review process. Here are some application hints. Verify the location of your project and the correct reviewing jurisdiction. Land Lot – District – Section – Parcel Number can generally be found using the County or City GIS online viewers. ePs will time the user out of the application after 30 minutes of non-usage. Reveiw the application and gather your information prior to completing the details portion of the application. After the submission of the project data, ePs will create the “Project Page”. Prior to uploading plans, you will be required to pay the ePs fee. The fee is dependent upon the type and size of the project. To do this select the PayNow button on the page. Once payment has been received by ePs, your project will be updated to allow uploading. If the fee tab doesn’t update with a confirmation notice refresh your browser. If it still hasn’t updated email us. Once the files are uploaded, you need to apply the “Tag” to the file. This will help the plan review identify which files are associated with the information that they will review. To select the tag, select the Tag icon to the left of the file name. 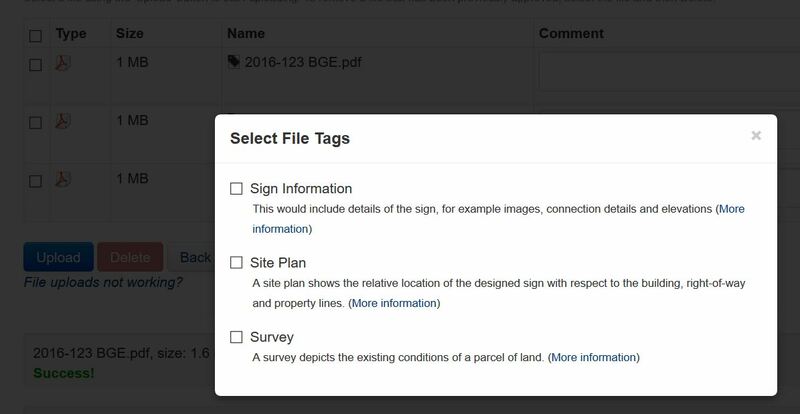 Select the check box that most accurately describes the file and then click back on the main screen of select the “x”. 5. Once the project has been submitted, the jurisdictions staff will post the plan review fee and instructions on how to pay it. The review of your project may not start until all plan review fee has been paid.